Silicon-based Dow Corning sealants last longer and are more versatile than most organic polymer sealants. They are durable, one part RTV sealants, cure at room temperature to a tough, rubbery solid with exceptional performance characteristics, and meet a wide variety of your industrial bonding and sealing needs. ﻿ ﻿﻿ You can search on request , or product name you will find on link "More". ● Stability over a wide temperature range – When fully cured, our products can be used at temperatures ranging from -65° to 350°C. ● Weather resistance – High resistance to UV rays, radiation and weather prevents our products from hardening, cracking, crumbling, drying and becoming brittle. ● Chemical stability – Our sealants do not readily degrade even under long-term exposure to many chemicals and atmospheric pollutants. ● Good bond strength – Our products provide good adhesion to a wide variety of industrial materials, including glass, ceramics, and wood masonry, painted surfaces, and many metals and plastics. ● Electrical properties – Designed for a variety of applications, our products can be used in various electrical and electronic applications, including devices that are thermally cycled over a wide temperature range. ● Low Flammability – In fire conditions, silicone adhesives/sealants are reluctant to burn. Many products comply with UL flammability standards. When you specify an assembly and maintenance product from Dow Corning, you receive a solution backed by the world leader in silicone technology with more than 60 years of expertise and innovations. Although Dow Corning silicone sealants possess excellent bond strength, maximum adhesion is only attained on surfaces which are clean and dry. Contaminants, such as dirt, grease, water, tar or rust act as release agents and prevent the formation of durable bonds. It is strongly recommended, therefore, that wet or unclean surfaces be properly prepared before sealants are applied. ● Wipe contaminated surface with a clean, oil-free cloth. ● Rewipe surface with a suitable cleaner or industrial solvent, such as IPA, mineral spirits, naphtha or ketones. Note: Do not clean surface with detergent or soap. Soap residue may act as release agent. ● Rough rubber surfaces with sandpaper. Make a spot check to determine the adhesion of sealants for each application. Bond strength will increase as the sealant cures. Apply Dow Corning adhesives/sealants to one of the prepared surfaces, then quickly cover with the other substrate to be bonded. On exposure to moisture, the freshly applied material will “skin over” in about 5-10 minutes (depending on the product) at room temperature and 50% relative humidity. Any tooling should be completed before this skin forms. The surface is easily tooled with a spatula. 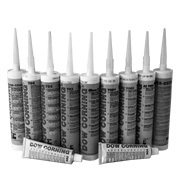 For maximum adhesion, the use of Dow Corning primer is recommended. After solvent cleaning, a thin coat of Dow Corning primer is applied by wiping, brushing or spraying. At normal room temperatures and humidity conditions (room temperature, 50% relative humidity), the primer should be allowed to air dry from 5 to 30 minutes. The primer cures in contact with air moisture, low humidity will necessitate longer drying time. The required drying time for a specific area should be determined prior to use. Primer which was allowed to cure extensively will not promote adhesion anymore. As a general rule, drying time of more than 6 hours at normal temperatures and humidity should be avoided. completely. Cure time is extended at lower humidity levels. As the sealants cure by reaction with moisture in the air, keep the container tightly sealed when not in use. A plug of used material may form in the tip of a tube or cartridge during storage. This is easily removed and does not affect the remaining contents. Some Dow Corning adhesives/sealants release a small amount of aceticacid during cure. This may cause corrosion on some metallic parts or substrates, especially in direct contact or when the cure is carried out in a totally enclosed environment which would not allow cure by-products to escape. DOW CORNING SPECIFICALLY DISCLAIMS ANY OTHER EXPRESS OR IMPLIED WARRANTY OF FITNESS FOR A PARTICULAR PURPOSE OR MERCHANTABILITY. DOW CORNING DISCLAIMS LIABILITY FOR ANY INCIDENTAL OR CONSEQUENTIAL DAMAGES.